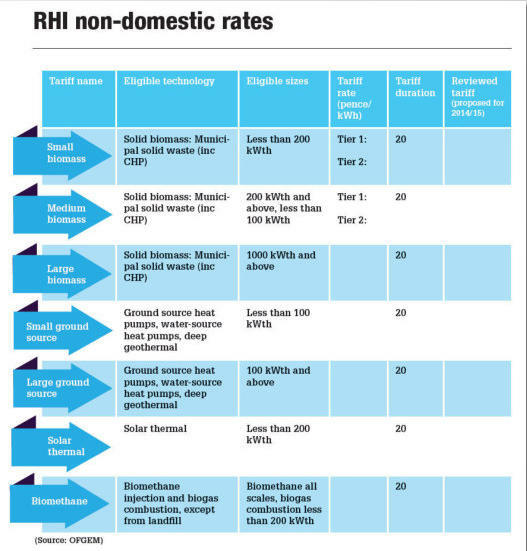 The most up to date news about the non domestic RHI scheme including their tariffs and grants. RHI Payments Payments are spread over 20 years, and a payment will be received every 3 months. Payment amount will depend on: The type of technology you install. How much energy the installation can produce (its capacity). How much energy you actually use (you get a certain amount per kilowatt hour). Small and medium-scale biomass tariffs have 2 payment rates called ‘tiers’. You’ll be paid at the tier 1 rate up to a certain limit. If you use more energy than that, the rest of the energy is paid at the tier 2 rate. You can find our how much you would be eligible for on the Ofgem website. If the capacity of your installation isn’t listed by Ofgem, it’s not eligible for the Renewable Heat Initiative. How do I apply? Create an account on the Ofgem website and provide information about your installation online. Send Ofgem evidence to support your application. Ofgem will accredit your installation, or reject your application and tell you why. Once accredited, you must send a report to Ofgem every year to confirm you’re still eligible.